Hey-o! My name is Meaghan (aka: The Unapologetic Knitter) and I'm secretly taking over the Ewe Ewe Yarns blog for a few days. Ok. It's not a secret. Heather knows and is just about as excited to have me host this knit along as I am. Can you believe that it's not only already February, but that Valentine's Day is NEXT WEEK? Yeah, next week. Check your calendar... it's next Friday. I hope you've got something romantical planned for you and your special someone. And if you're flying solo this V-day then I hope you have plans to spend a lot of time with your WIPs! Shall we get on to this knit along thing then? Alrighty. Today is the first of three parts of the Penpal Hat (quickie) KAL that will wrap up just in time for Valentine's day. We'll have two more posts: one next Tuesday and the third and final post next Thursday where you'll be just a few short rows from finishing your project so you can give it as a gift to your loved one (or keep it for you since you probably love yourself). I plan on giving mine as a rather belated Christmas gift. *hanging my head in shame*. Today we'll be using the size US 6 (4mm) and size US 8(5mm) circular needles and the stitch markers. You can keep your double-pointed needles and tapestry needle on hand for the final post next Thursday. I'm going to be knitting the slouchy version of this hat so I cast on my 96 sts and joined in the round. And that's the first little tidbit I want to share with you. There are multiple ways to join in the round but I definitely have my favorite. I'm sure there are arguments for and against every style of joining in the round so by no means should this replace your favorite method. But since I'm driving the bus this week I figured I'd share mine. One rule always applies to joining in the round, though: make sure your sts aren't twisted before you join! Ok, moving on. I guess I'll call this the criss-cross join. 1. Holding the needle with the last stitch cast on in your left hand, you'll pick up this last stitch, purl wise, and slip it to the right needle (just like a sl 1). 2. 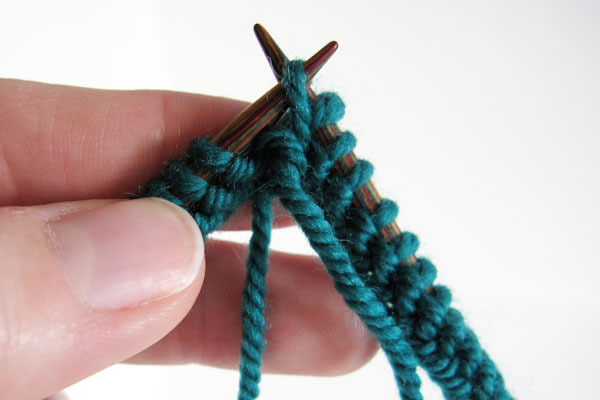 Next, with your left hand needle, you're going to reach past this newly slipped stitch and pull the first stitch you cast on OVER the stitch you just slipped (a lot like a PSSO except this stitch isn't technically slipped). Now it'll look like this with a weird criss-cross. The stitch that is now the first stitch on the right hand needle may loosen up a bit but thats ok. You can always tug it snug by pulling gently on the working yarn tail and the cast on tail. 4. Now you can place your stitch marker right in between those two needles and start knitting your rib. Et voila! No need to seam up that little first stitch when it's time to finish the project. Just weave in your ends and you're done. Work your 2x2 rib to the length indicated for your choice of hat as per the pattern. Once you've reached your desired length it's time to change to a larger needle and increase a few stitches. You'll be simultaneously working an increase row and changing to a larger needle. First, to change needles, at the risk of pandering, there's no need to slip all your sts from the smaller needle to the larger. 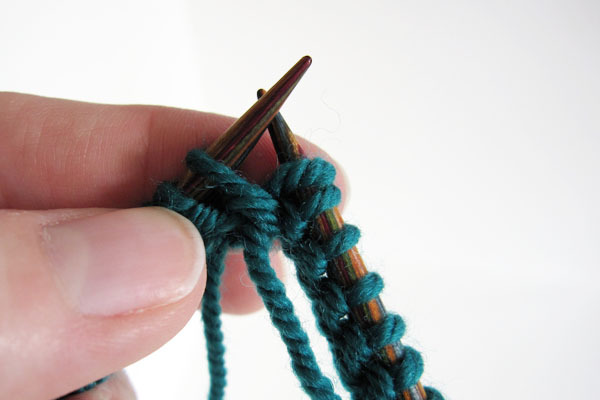 Just pick up your larger needle at the beginning of the round and start knitting. Eventually the stitch marker will fall off since there isn't anything holding it on to the smaller needle. Be sure to put it back in place before you continue working in the round at the end of the increase row. 1. Knit into the front of the stitch as you would normally work a knit stitch except don't slip the yarn off the left hand needle just yet. Now twist your yarn as if to work into the back of the same stitch. 2. Point the right hand needle down just a bit and work into the back of this same stitch. Wrap the yarn around the needle and pull it through the loop. 3. It looks a bit chaotic but it works. Now pull the yarn off the left hand needle and you'll have increased one stitch. You know you'll have done it right if you have a little purl bump at the base of the 3rd stitch. Continue the round making your increases as necessary for your style of hat and that's where we'll stop for the day. See... wasn't that painless for the first step of the KAL? Super quick, right? Now you can go about your day and work on some of your other projects (because who DOESN'T have a WIP list as long as their arm?). On Tuesday next week, February 11th, we'll be starting on the next section: LACE! It's a fun repeat of rows that will work up in a wonderfully comfy wear-all-the-time hat. Thanks so much for joining me for Part 1. If you're still looking for yarn for this great little project, find a Ewe Ewe yarn store near you.